FIT ME, I am in LOVE! 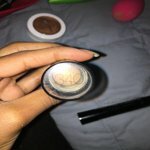 They discontinued my shade and now I have to hunt for the remainder on internet and overpay! Thanks a lot for giving me a great product that matched my skin perfectly and taking it away!!! Great product that definitely delivers! I discovered this foundation while I was picking up a tube of my tried and true waterproof Great Lash mascara. I'm so glad I decided to try it. This foundation stick is perfect for on the go, everyday wear and the shade is a near perfect match. In the future, though, I'll probably try using this foundation over the Blur + Defend primer SPF 30 for extra sun protection, since this foundation contains no sunscreen. Honestly, this remains the foundation with the best consistency, coverage and feel that I've tried so I keep coming back to it. I like the stick format and it doesn't dry out my skin the way other stick versions do. It blends in seamlessly (again, unlike other versions), perfectly matches my skin colour, doesn't clog my pores, and feels light and soft. Everyone's skin is different but for my 'normal' skin, it's perfect. I just wish it stayed on longer, but for the price I don't mind having to reapply. Does this have sunblock in it?